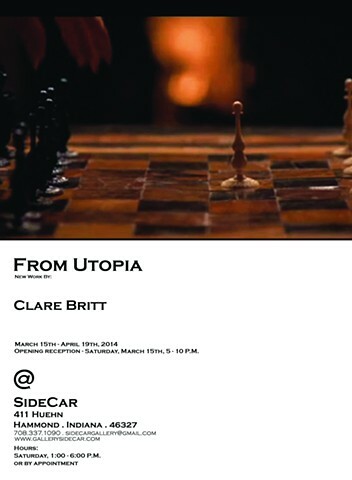 'From Utopia' - New work by Clare Britt, the artist’s first exhibition with the gallery. While Britt’s background is in photography, the work in the exhibition ranges from collage-based text pieces to a site-specific installation. Populating the main gallery space are framed “Ransom Notes”, collages made of text cut out of fashion and lifestyle magazines targeting a female audience. Ransom notes come as a last resort, drastic means to extreme ends. To Britt the ransom note is about demanding and wanting and these notes represent Britt’s wants and demands of herself and of others. They quickly expand into mantras, things we tell ourselves, things we think but would never say. Ransom notes are anonymous and from that anonymity their author gains power. If the ransom notes are a verbalized communication of the artist’s interior life, then the installation in the second floor project space is a pre-verbal or nonverbal expression of that life. While the Ransom Notes have a tone of aggression, desperation and frustration, the installation is a calming ensemble of color and abstraction derived from Britt’s practice of meditation. Tension is not gone, a central feature is a tightly bound ball of paper, but where acerbic wit is a coping mechanism in the collages, in her installation Britt deploys color and abstraction. Clare Britt lives and works in Chicago. Previous solo exhibitions include “The Longer Your Instrument Is The More Power It Has”, Medicine Cabinet, Chicago (2010) and “First Place”, CoSign, St Louis, MI (2009). Selected group exhibitions include “Relay Relay”, Ortega Y Gasset, Brooklyn, NY (2013); “Installation Views”, curated by Sofia Leiby and Christopher Schreck at New Capital Projects, Chicago (2012) and “Nooks and Crannies”, curated by Cole Roberson at Columbia College, Chicago (2010). From 2003 - 2007 Britt co-directed Fraction Workspace, an artist run gallery.